Over a quarter of a million! That’s how many clams Sarasota Bay Watch is growing with the help of a professional clam farmer. The clams were spawned in a shellfish hatchery and spent the first few months of their lives there, growing into 4 mm big “seed stock.” They next were placed in fine mesh “nursery bags” that were placed on the bay bottom in Charlotte Harbor by Sand Flea Key, where they stayed for 71 day until they outgrew their temporary home. 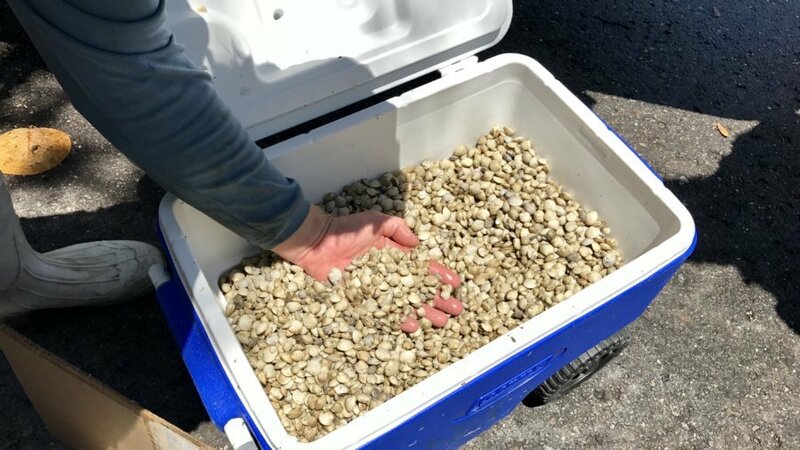 We then harvested the clams and “flipped” them into larger mesh “grow out bags.” They will now continue to grow for about 1 year to reach top neck size (over 2 inches), big enough to be essentially predator proof, at which point Sarasota Bay Watch volunteers will release them into the wild. Check out recent posts of our Facebook page to see photos of the process. Venturing into clam restoration is a natural extension of our scallop restoration program, and it is important work to bring back thriving and self-sustaining populations of shellfish to our waterways. Our bays will be cleaner, our fisheries will be larger, and our marine ecosystems will stronger and more resilient. This exciting project is generously supported by START, the Disney Conservation Fund, and numerous local businesses and individuals. Sarasota Bay Watch is wrapping up the school year with more visits to elementary school classrooms with live scallops, clams and oysters, as well as a fun slide show and discussion of marine stewardship and conservation. We are thrilled to have had the opportunity to interact with about 450 students and teachers. We are particularly grateful for our high school student teachers from Riverview’s Stars to Starfish Program. They were great – cheerful and enthusiastic – and the grade schoolers loved them! On June 4th we host a group kids from the Big Brothers and Big Sisters program for a marine experience and kayak tour of the mangrove tunnels. This tremendous program is a continuation of a student-initiated project that helps connect children to the bay – children who otherwise may not be able to experience a nature-based paddle excursion. Many thanks to our partners Sarasota Yacht Club for providing lunch, and local outfitter FLOW for the use of their kayaks. Mark your calendars for June 3rd for an underwater cleanup of New Pass at Ken Thompson Park! This exciting event is a first and is the result of a partnership with the City of Sarasota, the City Police Department, and local dive clubs. If you are a certified diver this is a perfect opportunity to get a morning dive in while at the same time helping to clean up our bay. We also need kayakers to help collect and transport debris the divers bring up to the surface, as well as top side workers to sort trash and rescue entangled marine life. Go to sarasotabaywatch.org for details and registration for the event.